It would be an understatement to say that World War I affected many people around the world. The residents of Newfoundland were no exception. Many young men, who would only leave home to search for work, now found themselves traveling halfway around the world to defend their country. 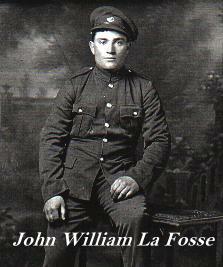 John William La Fosse was one such Newfoundlander. Fortunately John was a survivor of the war. Once the war terminated in 1918 he returned back home, back to New Harbour, Hermitage Bay. He restarted his life in the fishery. Initially, John resumed fishing from a small dory, as he had done prior to going to war. After a short period of time he secured a berth onboard a schooner with Captain Ashford. After a few years under the command of Captain Ashford, John felt he had acquired enough skills to command his own boat. In 1926, at the age of 28, John William La Fosse took his first command. The vessel was a 49-foot skiff named M.V. Danny Goodwin, owned by the local merchants of Rencontre West. The M.V. Danny Goodwin was built in Dartmouth, NS in 1907 and had been used as a fishing vessel for the past 19 years. Samuel Billard (a Rose Blanche fisherman) brought her to Newfoundland in 1912, where he operated her for 14 years. In the fall of 1926, the owners of the M.V Danny Goodwin decided to do some repair work to maintain the vessel's seaworthiness. This consisted of installing new frames. Like most fishing skiffs, she was originally built with large sawed frames. To strengthen the skiff, the repairmen installed smaller steamed frames between the larger ones already in place. Once the repair work was completed, the M.V. Danny Goodwin and her crew were now ready to go fishing. For the remainder of the fall and the coming winter, the crew would leave New Harbour and fish along the Western Shore. Fishing on the Western Shore was a common practice, mainly because the fishing grounds were much closer to the fishing ports than on the South Coast. In early December,1926, the M.V. Danny Goodwin and her crew of six arrived in the port of Rose Blanche on the Western Shore. They planned to make several trips before returning home for Christmas. After Christmas they would return back to Rose Blanche for the winter fishery. On the morning of December 6th, 1926, the Danny Goodwin, along with the remainder of the fishing fleet, departed for the fishing grounds on Rose Blanche Bank. The weather was favorable. The trip to the fishing grounds would take just over an hour. As the morning progressed, everything was going well. However, in early afternoon the wind started to increase from the South East, then changed to North East, accompanied by snow. The fishermen felt this was just another normal weather pattern for this time of year. Unfortunately, the men were unaware that this was the beginning of a ferocious winter storm that was approaching from Canada's mainland. The fishermen continued on as normal and finished hauling their trawl-with the exception of the crew of the M.V Danny Goodwin. She was last seen by Captain Gilbert Herritt of Rose Blanche in the M.V. Joan & Peter. At that time, she was noted to have only one of her two dories onboard. The second dory was still fishing. The remaining fleet decided to head back home. Later that day, as the storm raged off the Southwest Coast of Newfoundland, the fishing grounds were struck by high winds resulting in high seas. The visibility was also quite poor due to the snow. That same storm had already claimed the vessels South Head, W.C. Smith, Corona and the R.L. Mackenzie on the Nova Scotia coast earlier in the day. Luckily, and surprisingly, no lives were lost. Those back in Rose Blanche could only wonder about the fate of the Danny Goodwin. Morning arrived but the M.V. Danny Goodwin and her six-man crew were nowhere to be seen in the port of Rose Blanche. The local people thought that maybe the crew might have tried to find shelter in some other place along the coast. However later that day, a trawl buoy, anchor and several 'hooks of trawl' were found in the vicinity of where the Danny Goodwin was last seen. Family and friends of the crew feared the worst. As time went on they knew that the M.V. Danny Goodwin and her crew had disappeared for good. Many of the local fishermen have their own theory as to what lead to her misfortune. They believe that the repair work conducted in the fall was a major factor. They felt that the newly installed frames were much stronger than the original frames, therefore when the boat started to experience bad weather, the new frames forced the planking away from the old frames. This resulted in her seams opening up, taking on water and sinking. The final destiny of the Danny Goodwin will never be known. There were reports of a merchant ship coming upon a derelict in the vicinity of Rose Blanche Bank. However this was never confirmed. No bodies were ever recovered. Listed below are the crew that were onboard the vessel at the time of her disappearance.